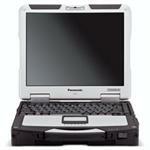 M Rugged Mobile Technology presents our refurbished Panasonic Toughbook® 31 MK3 , the reliable laptop offering the highest performance in its class along with the world’s most rugged design. of battery life (with optional media bay 2nd battery)set the Toughbook 31 apart from the competition. Six generations of delivering rugged performance plus 13 years of consistent docking compatibility, and you have a computer that will go the distance with you anytime, anywhere.